Chakra is the Indian word for wheel of energy. It is a spinning vortex shaped like a spinning top, with the bottom, pointed end connected to a part of the physical body. Crystal Dowsing catch the energetic field as an indicator of the spinning vortex status as: blocked, unbalanced or weak. There are seven major chakra and twenty-two minor chakra in the body and many meridians used in acupuncture medicine. Each chakra receives life-force energy often called chi (or qi), prana, or universal intelligence . When we are in a state of illness, the chakra may be distorted, out of alignment or even stagnant. When this happens, life force energy cannot flow in and out freely and the physical body may suffer. Stress, inability to express emotions, over emotional expression, beliefs non congruent with truth, disconnection from a higher power, unhealthy diet, lack of exercise, and exposure to toxicity can cause the chakra system to close down. Each chakra resonates with a particular frequency of vibration and is an integral part of vibrational medicine. Chakra are balanced by inviting them back together natural state of vibration and frequency using Color, Light, Sound, Aromatherapy, Touch Therapies, Crystals Energy or Sacred Geometry. By stimulating the chakra in a favorable way, the nervous system and therefore, the whole body functions are balanced and rejuvenated. Therapeutic dowsing and vibrational Crystals will bring back harmony, vitality after clearing the etheric field. Chakra are multidimensional, because they also penetrate astral, mental, and spiritual dimensions. * Balancing, clearing and energizing the aura field and Chakra system to improve anger, irritability, melancholy, confusion, difficulty to focus, lack of motivation and/or self-confidence, lack of purpose, creativity and/or "Joie de Vie" (Joy of life). 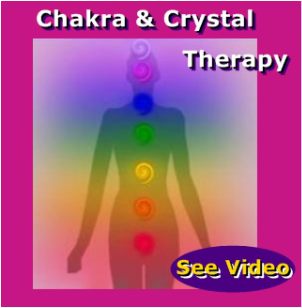 Intuitive Energy Healing ~ Crystal TherapyHealing with crystals had been used since beginning of civilization. One of the most details descriptions of the Atlantean use of a mysterious instrument called the Great Crystal was given by Edgar Cayce. Many crystals are as old as our planet. Some people think of them as Record Keepers of the planet. Complete spiritual transcendence when combine with Therapeutic Dowsing.